NEW YORK--(BUSINESS WIRE)--NantEnergy today announced a breakthrough in its six-year mission to develop the world’s first scalable air breathing zinc rechargeable battery system at a manufacturing cost below $100 kWh and to operate this intelligent digitally controlled system on a global scale. This green rechargeable battery, an air-breathing cell, uses just zinc and air, integrated with digitally controlled intelligence. The energy system is monitored in real time in the cloud and has been successfully deployed in nine countries with more than 3,000 systems supporting 110 villages and 1,000 installations across cell tower sites. Over 100 patents cover this breakthrough zinc-air technology which represents an important alternative to lithium-ion batteries. 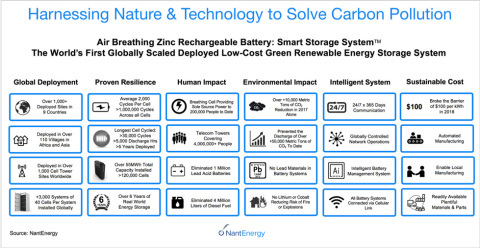 NantEnergy’s rechargeable green, air breathing zinc battery technology has now broken the manufacturing cost barrier of $100 per kilowatt hour, announced at the One Planet Summit. Manufacturing at scale will be available in 2019, providing a competitive source of energy compared to other energy storage technologies, making carbon free energy affordable and accessible in developing countries. NantEnergy announces largest global deployment of a novel air breathing zinc rechargeable battery – 3,000 installations in nine countries – has broken the $100 per kilowatt hour barrier. Microgrids of air breathing zinc rechargeable batteries with solar-powered storage are now providing sole source of power to more than 200,000 people in over 110 communities in Africa and Asia. Air breathing zinc rechargeable batteries are now deployed at over 1,000 telecom sites in the United States, Mexico, Southeast Asia, Central and Latin America. Sized to provide hours to days of load support to microgrids and telecom cell towers and designed to have a near 100% uptime requirement. Eliminated the need for 1 million dangerous lead-acid batteries. Offset over 4 million liters of diesel fuel. NantEnergy’s mission is to combine technology and nature to deliver reliable, affordable green energy to everyone, while avoiding the use of lithium, lead or fossil fuel sources of energy. The technology began with Thomas Edison who had tried to create a rechargeable zinc-derived battery, but the problem of zinc rechargeability bedeviled him. Over 100 years later, NantEnergy has solved that problem and has proven the viability and global scalability of deployment of the system. Now tested and refined for over the past six years, with the $100 per kWh barrier broken, large scale deployment can begin. “The concept of adapting nature and biology to address the issues facing our planet, including the need to reduce hydrocarbons, is fundamental to our work at NANT. Our air-breathing rechargeable zinc smart storage system epitomizes this vision. This is the first energy system that combines zinc, an essential mineral energy source needed for prenatal growth and the human body, with oxygen, an essential gas needed by every living cell, with the power of the sun to generate a chemical reaction in a sustained, repeatable, rechargeable manner, generating electrons and energy. By harnessing biology, chemistry, the air and the sun, we are designing energy sources of the future to electrify the world,” said Patrick Soon-Shiong, MD, Chairman of NantEnergy, Founder of NantWorks. “Zinc occurs naturally in the earth and in the food we eat; it is healthful and abundant,” Soon-Shiong continued. “The desire to develop zinc as a source of rechargeable energy has eluded scientists for a century and I am so proud of our scientific team who have made this important breakthrough. By harnessing nature and technology, we have created a path to solve carbon and other types of pollution and establish low-cost, decentralized energy which can provide power to people everywhere,” said Soon-Shiong, who is also Chairman and CEO of NantWorks. During the One Planet Summit in New York, Soon-Shiong noted that these green, air-breathing batteries avoid lithium and cobalt, replace diesel and lead-acid batteries, and present no risk of fire or environmental contamination. “The proven deployment of the NantEnergy air breathing zinc cell storage system, together with clear pathway to sub $100 kWh costs, is a potential game-changer for affordable electricity and reducing hydrocarbon usage in emerging market countries. This is particularly compelling in our markets where we see an increasing penetration of renewables. An affordable energy storage can deliver real results in off grid and island environments,” said Sean Petersen, Principal Investment Officer, International Finance Corporation (IFC) Venture Capital. The International Finance Corporation (IFC), a member of the World Bank, is an investor in this technology. NantEnergy, formerly Fluidic Energy, is dedicated to accelerating the worldwide transformation to clean, reliable energy through its innovative and intelligent energy storage solutions. Enabled by groundbreaking battery technology and smart-grid intelligence, NantEnergy designs, manufactures and markets long-duration energy storage solutions globally. As the first company to deliver rechargeable zinc-air battery technology in high production volumes, NantEnergy has over 120,000 batteries globally with its industry leading whole product approach. NantEnergy continues to build momentum as the long-duration energy storage leader, installing systems worldwide that increase reliability, functionality and surpass cost targets necessary for practical energy storage adoption. While meeting market needs now, NantEnergy is paving the path for the smart, sustainable and accessible grid of the future. NantEnergy’s mission is to combine technology and nature to deliver reliable, affordable green energy to everyone. The technology began with Thomas Edison who had tried to create a rechargeable zinc-derived battery, but the problem bedeviled him. Over 100 years later, NantEnergy has solved that problem and has proven the viability and global scalability of deployment of the system. Now tested and refined for over the past six years, with the $100 per kWh barrier broken, large scale deployment can begin. The concept of adapting nature and biology to address the issues facing our planet, including the need to reduce hydrocarbons, is fundamental to the work at NANT. The air-breathing zinc rechargeable smart storage system epitomizes this vision. This is the first energy system that integrates zinc, an essential mineral energy source needed by the human body, with oxygen, an essential gas needed by every living cell, with the power of the sun to generate a chemical reaction in a sustained, repeatable, rechargeable manner, generating electrons and energy. By harnessing biology, chemistry, the air and the sun, NantEnergy is designing energy sources of the future to electrify the world. Zinc occurs naturally in the earth, and in the foods we eat; it is healthful and abundant. The desire to develop zinc as a source of rechargeable energy has eluded scientists for a century. By harnessing nature and technology, NantEnergy has created a path to solve carbon and other types of pollution and establish low-cost, decentralized energy which can provide power to people everywhere. When sun is available, electricity is generated from photovoltaic solar panels and in the charge process, Zn Air battery system uses this electricity to convert zinc oxide to zinc and oxygen. This electrochemical reaction generates zinc which serves as a storage form of energy. In the discharge process, the battery system converts the electrochemical energy from the zinc by combining (oxidizing) the zinc with oxygen from air, generating electrons. Thus, the cycle is from electricity generated from multiple sources, to zinc storage, via an electrochemical reaction, and then, to electrons leading to the transmission of electricity. By breaching the manufacturing barrier of $100 kWh, we can electrify the world anywhere everywhere.